CSU Channel Islands University Park is a 367 acre parcel located adjacent to CSU Channel Islands off of S. Lewis Road in Camarillo. It is a regional educational and recreation area owned and operated by California State University Channel Islands. The park is open to the public daily from sunrise to sunset. Do note that there are no facilities at this park, like restrooms and drinking fountains. You can walk, hike, run, bike, etc. and perhaps come across some wildlife. One item of historical interest at the park is the "Scary Dairy," a dairy farm located on the parcel that closed in the 1960s and was disbanded and subsequently vandalized and graffittied upon over the decades. From Camarillo, take Lewis Road south to Camarillo Street and turn left (east). Cross the bridge over Calleguas Creek and the entrance is on the left. Parking is $6 per vehicle (as of April 2019). Visit www.csuci.edu/cipark for more information. Bring cash to pay for parking at entrance. NOTE: Camarillo Grove Park recently (April 2019) re-opened after being closed due to damage resulting from the Hill Fire in November 2018. The following areas remained closed until work is finalized; small dog park, Nature Center and the trails. Nature Center and small dog park are planned to be re-opened by the end of April. The trails will take a bit more time due to the extensive damage. The play structure has been removed and will be replaced at some point in the future. Camarillo Grove Park is located at the bottom of the Conejo Grade at 6968 E. Camarillo Springs Road (Camarillo Springs exit). This is kind of an off the beaten path park that has a variety of interesting activities. There is an off-leash dog park where you can bring your pooch. There is a small playground area for the kids. There are several large outdoor covered group picnic areas that are popular for parties. Additionally, the park has some fun trails for roughly a mile** or so of hiking and exploring. At the back (east) end of the park you'll see the trail sign. the lower loop is fairly short, with some interesting, large rock formations. The upper loop is more significant and steep and provides for some nice views. Two miles of new trails with over 20 interpretive signs were added in January 2017. This park offers multiple options for hiking. The lower loop is an easier gently sloping trail with oak trees, sage, volcanic rock formations, and more. You can even take dogs off-leash on weekends Saturdays and Sundays before 10 a.m. The park opens at 7:30 a.m. until dusk. There are parking fees at this particular park to help pay for the upkeep of the park. As of January 2018 these fees are $3 on weekdays, $5 on weekends and $10 for oversized vehicles (RVs, etc.) on weekends. Or buy an annual pass for $55. Learn more at pleasantvalley-web.civica2.granicuslabs.com/parks/park_list/camarillo_grove_park.asp . Here's a compilation of parks in and around Ventura County as well as adjacent areas that have off-leash opportunities for your pooches. The days and times indicated below are subject to change; links to the local recreation and park districts have been provided below. A bit brown at the Conejo Creek Dog Park due to the drought. But there are grassy sections too. Additionally, Conejo Recreation and Park District opened three smaller off-leash area dog parks in 2015 at Estella Park, 300 Erbes Road, Thousand Oaks, Kimber Park, 3295 Bear Creek Road, Newbury Park and Walnut Grove Park, 400 Windtree Avenue, Thousand Oaks. These areas do not have grass. More details at crpd.org/parkfac/dogpark. The 1.2 acre Westlake Village Dog Park opened to the public on July 21, 2018. The park features small and large dog areas, shade shelter with seating, pet wash stations and more. Located at the southwest corner of West Oak Crest Drive and Agoura Road. On street parking available. Mission Oaks Park at 5501 Mission Oaks Boulevard has a designated off-leash area open the following time frames: Monday - Friday: 4pm-Dusk; Saturday - Sunday: Dawn-Dusk. Learn more at www.pvrpd.org/parks/dog/mission_oaks_park.asp. NOTE: Camarillo Grove Park is closed until further notice as a result of the Hill Fire of November 2018. Updates at THIS LINK. A view from above of the nicely appointed Oak Canyon Dog Park in Oak Park. There is a designated dog park at College Park, 3250 South Rose Avenue, Oxnard. It is open 7 am to dusk daily. An additional dog park is at Campus Park at 5th and H Streets. Also open dawn to dusk daily. There is a non-gated off-leash dog park area at Arroyo Verde Park at the corner of Foothill and Day Roads in Ventura. It is available for off-leash use Tuesday through Sunday from 6 am to 9 am. There's a fenced in dog park at Camino Real Park at Dean Drive and Varsity Street in Ventura. Open every day from dawn to dusk. The Calabasas "Bark Park" is located at 4232 Las Virgenes Road. Open 5 am to 9 pm daily. www.cityofcalabasas.com/recreation/barkpark.html﻿. Bark Park is now partially re-open after it was closed for months as a result of damages from the Woolsey Fire of Nov 2018. We are fortunate to have such great trails and views of Boney Peak from in Newbury Park. At Wendy and Potrero is the Western edge of the Santa Monica Mountains where Sycamore Canyon cuts through Rancho Sierra Vista/Satwiwa and Point Mugu State Park. Roughly a mile easy hike from Wendy/Potrero gets you to the Satwiwa Native American Indian Culture Center where you can explore some native Chumash items and educational information and chat with rangers. This is a nice little hike to take the kids on. There are restrooms and water at the center, which is open from 9 to 5 on weekends. 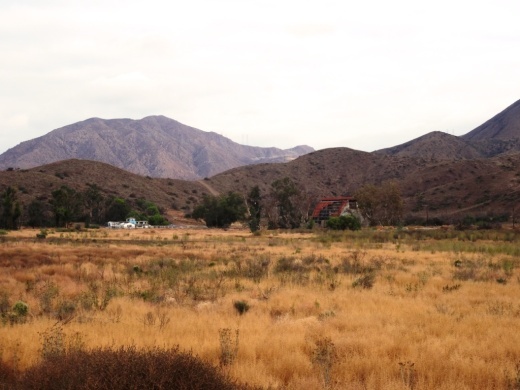 Learn more about hiking in Rancho Sierra Vista/Satwiwa at THIS LINK. 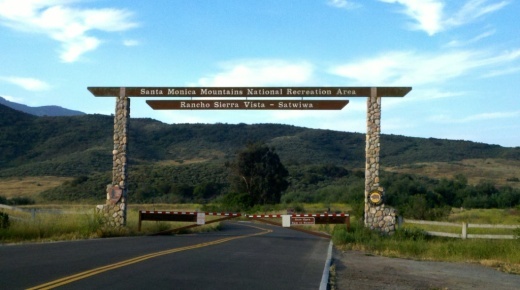 You can get easier access to the center by parking in the adjacent National Park Service parking lot via Lynn Road to the access road at Via Goleta in Newbury Park. Another mile and a half of hiking gets you to a small waterfall, which is fun to check out with the kids but somewhat more strenuous of a hike. Note that in recent years (2012-2015), the waterfall has barely flowed due to low rainfall. Here is more information about the Boney Mountain Trail, leading up to Hidden Valley Overlook, the waterfall and Danielson Monument. Click here for a pdf file describing these and other local trails or go to the National Park Service website at www.nps.gov/samo. Visit www.nps.gov/samo/planyourvisit/rsvsatwiwa.htm for a map and site information on the National Park Service website. Trailhead at the corner of Wendy Drive and Potrero Road in Newbury Park. Park on the dirt on the south side of Potrero or on the street on Wendy. The Calabasas "Bark Park" is located at 4232 Las Virgenes Road. To get there from the 101, take Las Virgenes Road south just under a mile. The entrance is on the left (east). If you're going fast, it is easy to miss it. It's a nice, local dog park open 5am to 9pm with a plenty of space for the doggies as well as a separate gated kids' play area and plenty of parking. Bark Park was closed after the Woolsey Fire of November 2018 but is now (as of April 2019) partially reopened. Trailhead to the Bark Park Trail is on the north side of the park.On the north side of the park is the trailhead to the Bark Park Trail, a 1.2 mile climb that links you up with the New Millenium Loop Trail. Round trip you're talking about a 2 1/2 mile hike. It is a nicely maintained trail with a steady, uphill climb, which means that the way back is a lot quicker than the way up. I would call it a moderate climb for the most part. A good walk to take the kids on. But it can get a bit hot up here, so bring water and sunscreen on summer days. Trail sign at the junction of Bark Park Trail and New Millennium Loop Trail. As you can see from the sign, there's a lot more exploring you can do on these nicely maintained trails in Calabasas. A view of the Bark Park from the trail above. A view of the Bark Park from the trail above.More on the Bark Park at www.cityofcalabasas.com/recreation/barkpark.html. Malibu Creek State Park is accessible in Calabasas, at 1925 Las Virgenes Road, south of Mulholland. The park contains over 8,000 acres of rugged, beautiful hills, trails and scenery. It stretches from Agoura Hills down to Malibu, down to Malibu Lagoon State Beach, covering much of the 25 mile Malibu Creek that flows from Boney Mountain down to the Lagoon. Malibu Creek is the only stream channel that crosses through the Santa Monica Mountain range. There are three natural preserves in the park, Liberty Canyon, Udell Gorge and Kaslow, which protect Valley Oaks, rare plants and volcanic formations. Things to do in Malibu Creek State Park include hiking, running, biking, camping, picnicking, fishing and checking out the wildlife. There are over 35 miles of trails and fire roads throughout the park. A fun added bonus is the old M*A*S*H series set, filmed from 1972 to 1983, that resides there. Dogs are not allowed in Malibu Creek State Park trails. Malibu Creek State Park contains roughly three dozen different trails, many easy, and some...extraordinarily challenging, such as the Bulldog trail, taking you to 2,500 foot peaks with panoramic views out to the ocean and surrounding peaks and valleys. Parking for the day at Malibu Creek State Park is currently $12, or $3 per hour. You can also park at the corner of Mulholland and Las Virgenes and make your way into the park via the Grassland Trail. The campground at Malibu Creek State Park has 62 campsites and 4 RV sites. Visit www.parks.ca.gov/?page_id=614 for more information. It has been closed since June 2018 as a result of a fatal shooting. It was still closed as of 4/18/19 but the ranger I spoke to was hopeful that officials would re-open it next month. The old M*A*S*H site is about 2 1/2 miles from the parking area. The Visitor Center is only a 10 minute walk from the parking lot and is generally open from noon to 4pm on weekends. There's also an interesting visitor center about 1/2 mile from the main entrance to the park. It is open on Saturday/Sunday from noon to 4pm, subject to availability of docents. Worth a stop as there are some neat things to see in there, including wildlife and rocks/artifacts and other useful information. You can also purchase drinks in there as well as a small assortment of other items. Hike to the Rock Pool at Malibu Creek State Park! NOTE: CHARMLEE WILDERNESS PARK SUSTAINED MAJOR DAMAGE IN THE WOOLSEY FIRE OF NOVEMBER 2018 AND WILL BE CLOSED UNTIL FURTHER NOTICE. CHECK THEIR WEBSITE FOR UPDATES. WE WILL ALSO STAY TUNED FOR UPDATES. Charmlee Wilderness Park is a 532 acre park located at 2577 Encinal Canyon Road in Malibu, just 15 miles from the Conejo Valley. It is located within the Santa Monica Mountains. There are over eight miles of hiking trails, a nature center, picnic areas and more. Park hours are 8 a.m. to sunset and the nature center is open on weekends from 8 a.m. to 5 p.m. (or dark, whichever comes first). Parking is available for $4. Visit the Mountains Recreation & Conservation Authority website at mrca.ca.gov/parks/park-listing/charmlee-wilderness-park for more information, trail maps and more or call 310.457.7247. To get there from the Conejo Valley, take the 23 (Westlake Boulevard/Decker Canyon Road) toward the ocean and turn left on Lechusa Road. Continue on Encinal Canyon Road and look for the sign on the right. Photos below courtesy of Suzy Demeter Photography. If you're looking for a trail a bit off the beaten path, check out the Western Plateau Loop from Conejo Center Drive in Newbury Park. The trailhead for this hike is adjacent to the City of Thousand Oaks Household Hazardous Waste Facility at 2010 Conejo Center Drive, Newbury Park. You can park in the dirt lot next to the trailhead and head on your way. The trailhead on Conejo Center Drive. It is mostly downhill over the first half mile or so of this 5 mile round-trip hike until you get to the Hawk Canyon Trail turnoff. You can either go straight from here and do a clockwise loop via the Western Plateau Trail or you can turn right on Hawk Canyon, which is a direct route to the Conejo Canyons Bridge. Hawk Canyon Trail is a fairly narrow, mostly single-track trail. The Hawk Canyon Trail is a fun, narrow trail surrounding by trees and other vegetation, like you're in the middle of nowhere. 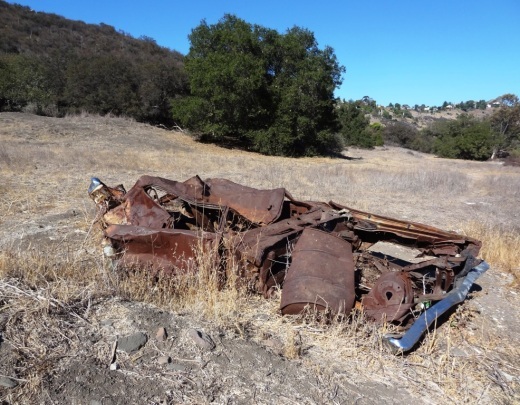 There's an old car in a crevice as you approach the Conejo Canyons towards Santa Rosa Valley. Odd to see this old car out in the middle of nowhere. steep embankment makes it somewhat challenging reaching it. Bring a snack and sit at a picnic table in the middle of what feels to be nowhere. Then either head back the way you came or find your way to the Western Plateau Trail and loop back counter-clockwise back towards where you parked. See the Conejo Open Space Foundation's map of this trail at www.cosf.org/website/html/western-plateau-hikes.html. It can get a bit overgrown in the spring as seen here on the Hawk Canyon Trail but quite beautiful nonetheless! Located at the Camarillo Airport at 455 Aviation Drive, the Southern California Wing of the Commemorative Air Force has hangars devoted to preserving, maintaining, displaying, and flying World War II aircraft. The Commemorative Air Force Southern California Wing Aviation Museum is open Tuesdays through Saturdays from 10 am to 4 pm and Sundays noon to 4pm. Closed Mondays, New Year's, Thanksgiving and Christmas. Donations of $10 for adults, $5 for ages 10 to 18, $3 for ages 6 to 10 are requested. Kids under 6 and active military are free. Visit www.cafsocal.com or call 805.482.0064 for more information. You can rent out the hangar for events! Visit hangarevents.com for more information. 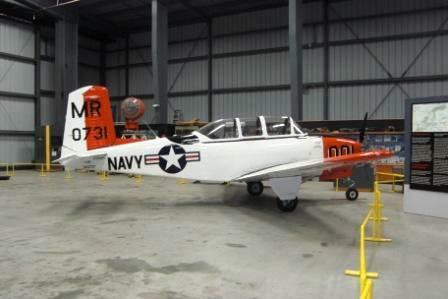 Also, take a vintage WWII airplane rides on the Marine Mitchell B-25 (BPJ), P-51 Mustang, BT-19, SNJ and Aircoupe. Details at www.cafsocal.com/warbird-ride-program. Docents are enjoyable to speak with as they have a lot of history to share at this museum. Two 15,000 sq ft hangars and a newer (2016) 32,800 sq. ft. hangar complex serve as a Museum Hangar and a Maintenance and Restoration Hangar. The Museum Hangar contains some of the many artifacts that are currently on display as well as a gift shop. It also houses any of the aircraft that are not away on a mission or undergoing maintenance. For safety reasons the maintenance hangar is not available for a walk-through, however visitors can observe any work in progress from behind a safety perimeter. There are a number of aircraft on display, including several you can physically inspect, which is always fun to do with the kids. There are some interesting WWII exhibits on hand too. The only authentic Marine BPJ-1J variant of the famed Mitchell B-25 Bomber. It flew into Camarillo from Midland, TX in 1993 for a 20 year restoration project. It is now flight-ready! The Kakovlev Yak-3 is widely considered the lightest fighter aircraft between 1939 and 1945. The North Ranch Open Space is represented by several massive sections of nearly 2,600 acres located in the east side of Thousand Oaks. There is a section east of Erbes Road to Westlake Boulevard down to Hillcrest Drive on the west side (this area is referred to as the Hillcrest Open Space Preserve) as well as a section further east bounded by Westlake Boulevard on the west, Lindero Canyon Road on the east and Thousand Oaks Boulevard on south. These hills are beautiful and quite prominent from throughout the Conejo Valley. Hiking, running and cycling these hills can be a challenge as they are quite steep in most sections. A main trailhead into the North Ranch Open Space is on Bowfield Street, just east of the North Ranch Playfields. The trail is called the Saddle Pass Trail, winding up and down the hills south towards Thousand Oaks Boulevard. There are various other neighborhood trail entry points throughout the vast area. One of these is located at Canyon Oaks Park, 6200 Hedgewall Drive, Westlake Village. There's a walkway and a small bridge that leads to a quite intense looking path up the hill. And indeed, it is a very steep path. Definitely not for everyone. This is a path into the Bowfield/Saddle Pass Trail, which is maintained by the Conejo Open Space Conservation Agency. Small COSCA sign at the bottom of the steep hill from Canyon Oaks Park leading into the North Ranch Open Space. A view of Canyon Oaks Park from about a third of the way up the hill. There are roughly 3 or 4 miles of trails up here, mostly the Saddle Pass north/south trail but other connector trails to nearby neighborhoods, such as the townhome complex on Via Colinas above Thousand Oaks Blvd and the new Westlake Village Community Park and YMCA. These hills get quite dry and hot during the summer months but in the spring green up nicely. You may even get the opportunity to enjoy some wildflowers. Orange beauties can often be seen in the March time frame off the Saddle Pass Trail south section. Here's another section of trail that connects homes off of Via Colinas into the North Ranch Open Space. Most of these connector trails are quite steep, though generally well maintained! California poppies on March 16, 2019. Located at the southeast corner of Westlake Boulevard and Thousand Oaks Boulevard, The Promenade at Westlake is an architecturally appealing outdoor mall that has an assortment of things to do, including two large fountains, a koi pond and the Cinepolis movie theater. One of two fountains at The Promenade at Westlake. Eateries include The Grill on the Alley, Marmalade Cafe, Farfalla Trattoria, Champagne French Bistro, Kreation Organic, Fresh Brothers, Lemonade, Paul Martin's American Grill and Soom Soom Fresh Mediterranean (opened in September 2018) and Shake Shack (opened in October 2018). Other stores include Cost Plus World Market, See's Candies, Sprinkles Cupcakes and Ice Cream and a variety of clothing and specialty stores, including Restoration Hardware, Brandy Glanville, Intermix, Lululemon Athletica, Sephora, Sharon Segal / Nina Segal the closet, Chico's and more. Lots of outdoor seating around the fountain area outside of Barnes and Noble. There is usually live music on Friday/Saturday nights during the summer months. The Promenade at Westlake is the sister mall of the similarly appointed The Commons at Calabasas. The Promenade is located at 100 Promenade Way, Westlake Village (southeast corner of Westlake and Thousand Oaks Boulevards). Visit www.ShopPromenade.com or call 805.497.9861 for more information. Vintage Grocers abruptly closed their doors on March 15, 2019. Bristol Farms announced in advance their last day of operation would be March 15, 2016. Public School 805 closed on June 17, 2018 (space now occupied by Shake Shack). Macaroni Grill closed in September 2013. Loteria Grill closed in Feb/Mar 2017. The Melt closed in December 2015 after a short, 7 month stint. La Salsa closed in spring 2011. Note: Park was closed as a result of the Woolsey Fire of November 2018, but was reopened January 11, 2019. There was some extensive damage in section of the park. 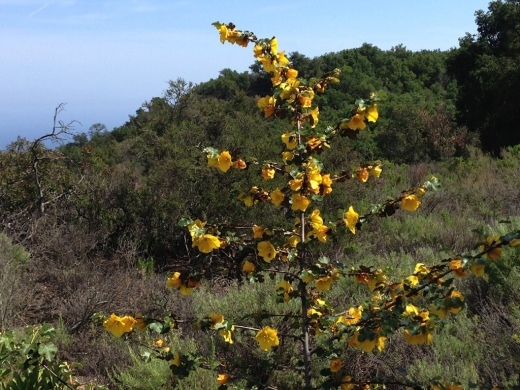 Owned and maintained by the Santa Monica Mountains Conservancy, 600-acre Triunfo Creek Park in Westlake Village/Agoura provides deep oak woodland, native grasslands and blankets of wildflowers in the springtime. The main feature of the park, the Pentachaeta Trail, is named after the Pentachaeta lyonii, a federally-listed endangered flower found in the park. The yellow, daisy-like flower is found only in Southern California, and blooms between April and June. An informational kiosk at the trailhead interprets the Pentachaeta lyonii, as well as other unusual wildflowers found on the site such as the Chocolate Lily, and the White Globe Lily. The site also provides access to hiking trails on the Westlake Vista parcel, also owned and managed by the Conservancy. Pentachaeta Trail to the east. Westlake Vista Trail towards the Las Virgenes Reservoir on the west. Pretty flowers off the Pentachaetta Trail in March 2016. The Westlake Vista Trail takes you to a fence that encloses the Las Virgenes Reservoir, where you may be treated to sounds of birds and other wildlife. Find the trail that parallels the fence up the mountain and you will be treated to gorgeous views of the area down to Westlake Lake and beyond and the Santa Monica Mountains to the south. Views towards Westlake Lake from the Westlake Vista Trail. Directions: The main trailhead with kiosk is on Triunfo Canyon Road east of the southern terminus of Lindero Canyon Road. There are a small number of off-pavement parking spots there. The other end of the trail is at the west end of Triunfo Canyon Road about 1.5 miles west of Kanan Road. Directions: From the 101 Freeway in Westlake Village exit Lindero Canyon Road. Take Lindero south to Triunfo Canyon Road. Turn left. The trailhead is located opposite Oak Forest Mobile Home. Visit mrca.ca.gov/parks/park-listing/triunfo-creek-park for more information. Demolished car sitting near Westlake Vista Trail.